In-Home Training - You change and your dog will change! Guaranteed! Is Your Dog Embarrassing You? (ON PURPOSE?) ​Let's Change That! Nathan Eating a Cracker - Haley Being Polite. 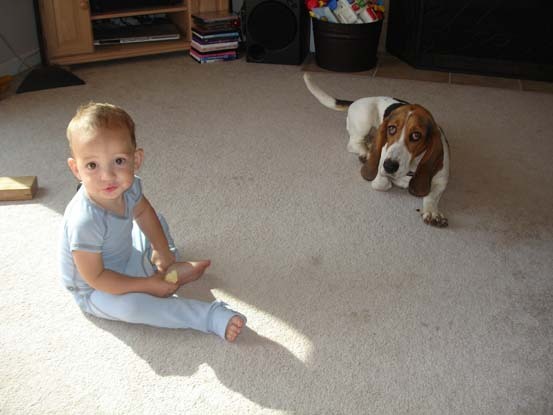 Baby Nathan eats a cracker while Bassett Haley lays nearby. This is a fe​w days after the lesson. "Holy Cow, Victoria! What spell did you cast on Josie? ​We have a totally different dog living with us now. You were here Wednesday night and Thursday everything was different. Josie is so attentive and amazingly calm. Never before has she so willingly dropped things when asked. When she does start a bad behavior all we have had to do is look at her. She either sits politely, lays down or goes to her bed. This new calmness is like when you have a baby for the first time and the baby is finally peacefully sleeping and you keep checking on them to make sure everything is all right. We keep waiting for the other shoe to drop and for the old Josie to re-appear. She’s not perfect yet, but we are thrilled with this huge improvement. She is not rushing to the gate every time someone comes in to our office and is pretty content to stay on her bed. Thanks for the great dog training session!" "When I called Victoria, I was getting desperate. Lola was too much dog for our little house (she’s 79 pounds and stands nearly three feet high at the shoulder) and was causing a lot of tension between my fastidious spouse and me. She was everywhere at once, always in our faces and having company over was a nightmare. (None of our friends or family enjoyed visiting us!) I had taken Lola to dog obedience classes elsewhere in town but these lessons barely scratched the surface. My husband resented her, and avoided her as much as possible. Victoria told me she wanted to come to our home and teach us how to get Lola to practice SELF-control. She said that we could INSTANTLY get Lola to calm down and ask permission for what she wanted. I was skeptical because it sounded too easy and frankly, we’d tried so hard already I was doubtful anything would work. Sensing my reluctance and lack of trust, Victoria mailed us a signed guarantee that said: “I promised you that I can, and will, teach you some new and useful techniques for managing and training Lola. You will be the sole judge of whether or not my lesson has been beneficial to you. I guarantee your satisfaction and hope to win it during our lesson or I will not charge you.” I called Victoria the day I got the guarantee in the mail. After yet another bad day with Lola, I begged Victoria to set an appointment ASAP as Lola was again making me CRAZY. Victoria quickly showed me and my even-more skeptical husband how to put ourselves back in charge and demand some respect in a gentle but very effective way. This work was done without even a leash! Within a very short time Lola was laying down to ask for attention and whatever else she wanted, whereas before, she’d be jumping all over us and pushing us around. It was a remarkable transformation. Two days later we had family over for dinner and they were amazed at the difference in Lola. We use the techniques we have learned every day, and Lola is calm and “asking politely” for what she wants, and we are being much more consistent in our expectations and relationship with her. The result is that everyone is getting along better – I’ve even caught my husband freely giving her attention and praise. Thanks, Victoria!" "My 13-year-old Mini American Eskimo’s barking had become out of control! She barked at anything and everything, and for as long as she felt like it. We could not stop her. Sometimes she would bark until she was hoarse or until she threw up! In a phone consultation, Victoria came up with a plan that would stop the excessive barking and put us back in charge. The exercises were simple and very humane, and Alki thought they were a fun new game! Within a week we were starting to see a difference! It has been almost a month now. Alki is doing really well. She is barking A LOT less, and is more relaxed. Everyone is enjoying it very much. Even a little bit of work made a big improvement, and she seems to be enjoying herself more now too. I guess she feels she has fewer responsibilities. Thanks so much Victoria!" Gracie (on right) with housemate and friend. "Coming home used to mean overexcited and out-of-control dogs. Our two dogs jumping up and barking, coupled with a stressful day, made opening the door to home frustrating. Victoria changed that by teaching us to calm our dogs. What a relief to return home and not face dog excitement on steroids. Thanks Victoria!" "After a death in our family, my husband and I adopted Jack, a Jack Russell Terrier, because no one else in the family could take him. ​​After we brought Jack home, it became clear he’d been abused and not very well socialized. He did not know how to interact with our other two dogs and was always trying to dominate them. He was aggressive with us and constantly on guard. He did not know he was in a safe environment. He did not trust our kind words and would flinch any time my husband or I tried to pet him. He spent most of his time on the fringes of our home environment and did not interact with us or our other dogs. He bit me the first week we had him. He never wagged his tail. I knew the only option for him, because of his aggression and biting, was to be put to sleep because nobody wants a dog like this. However, we decided to do all we could to help him. At our wits end, we scheduled an appointment with Victoria. Jack responded really well to training although it took him a bit longer in some areas due to his obstinate nature. But the dog training lesson was what cracked Jack’s hard shell. The structure he received allowed him to feel safe. One night while Victoria was getting ready to leave, and Jack had given his all during the training, he rolled over on his back and let me rub his belly. I knew we had reached a break through. Victoria’s training gave my husband and me skills to work with, and understand, Jack. This insight was invaluable. He still has to be monitored more than our other two dogs, but we have seen a sweet dog emerge who has a wonderful personality and a very big heart. Oh yeah… and he now wags his tail." "Hi Victoria. Glacier is doing great! He is like a different little dog now. He’s still a rambunctious puppy, thank goodness, but he has learned so much over the past couple of months. He knows how to sit and stay and lie down and heel, and sometimes come – we’re working on that one! I think what is most important is that we are communicating well with each other. He is a lot of fun to be with, he is very happy and healthy and loving, and he and Nube have started playing with each other, which is absolutely wonderful! Glacier also (most of the time) responds to “quiet” when he is barking. When I’m making their dinner for them, Glacier knows now that he is supposed to lie down and not bark at me (I do allow him to wiggle and whine a little). He used to jump up on me and on the counter and bark. What a delightful change!" "When we hired Victoria to come work with Abby, things were a real mess. Our dog had to stay locked in the bathroom during the entire lesson as she was too aggressive to work with Victoria. I took the whole lesson without her. Victoria taught me her techniques with an imaginary dog… It worked great and was understandable and I was later able to apply the techniques to Abby after the lesson. I am glad to say Abby is a totally different dog. She obeys us now and is much less aggressive with people visiting our home. Most guests are no problem at all with Abby, others are, but Victoria taught better ways to manage her, which we do while we continue to work with her. We even just got a new puppy and Abby is the perfect big sister we knew she could be." Gus, with hot dog on paw, "asking permission" to eat it. "I’ve read Victoria’s newsletter for years and used the tips with great success but I was at my wit’s end when I called her for help. My boxer/pit mix went from being easy-going to super reactive enough to have hurt another dog and I didn’t know what to do. ​I was so impressed at how quickly Gus picked up on the lesson! Within a short time he was doing things that I thought were impossible. He now will lay down at the front door instead of bolting out, he will leave a piece of hot dog on his foot when I ask, and the most amazing thing is when we were in the back yard and someone was mowing in the park behind us normally he would have freaked out and went after one of our other dogs, he now trots up to me for attention instead of reacting. It was AWESOME! In just a little over a week he went from a dog who was going to have to be put down to a dog who looks to me for attention and direction instead. Both Victoria and my dog Gus are geniuses!" "I contacted Victoria during a very bad day I was having with our 5-month-old Pug, Boba. He was out of control and making my life miserable. She sensed the panic in my voice and got back to me immediately. I was skeptical when I heard her describe her methods, but I felt the confidence in her voice and was reassured by her money-back guarantee. During our in-home visit, Boba was transformed. Even my husband, who has trained many hunting dogs, was amazed by the results. Everybody in our house now enjoys Boba. Victoria’s dog training lesson was the best investment we have made in our dog. I wish I had called her sooner!" "When I met Victoria, I was having serious problems with my 1-year-old coonhound, Ryan. I had taken him to a standard 6-week dog obedience class, which hadn’t helped me, and I had reached the point where I was so frustrated I was considering returning him to the Humane Society. I simply could not get Ryan to listen; he excelled in ignoring me. Well, after one lesson with Victoria, everything changed. I learned what I needed to do to reclaim my position as the leader and how I needed to change my behavior so Ryan would do what I want. We now work much better together and I plan to continue his training, as he is now quite eager to learn. 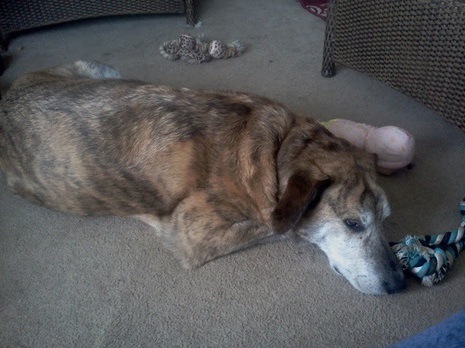 An amazing difference compared to the dog I despaired of only a few months ago." "Being retired and on social security, I was afraid to spend the money on a private dog training lesson, but Victoria guaranteed her work and my little Tazzy (as in “Tasmanian Devil”) was OUT OF CONTROL and ruling the roost. Victoria came to my home for a lesson in which she taught me gentle methods to take charge. There was no rough handling of Tazzy at all. Now I AM in charge and Tazzy is as happy as can be. Victoria was worth her weight in GOLD!" 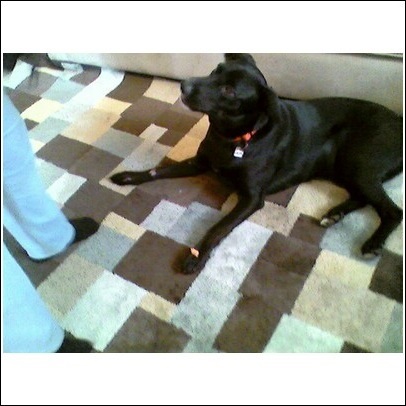 ​"Unmanageable" Quincy with treat on right paw. Quincy - "Now a new dog!" "Victoria – I am seriously amazed at what you were able to accomplish in our lesson! I have a new dog! I am amazed that the dog I had two weeks ago, the one who was jumping up to the kitchen counter and clobbering and climbing all over me when I was on the phone, and running out the front door whenever it opened (he got hit by a car while waiting for our lesson) now peacefully rests on the floor and waits patiently for my instructions. It’s a dream! 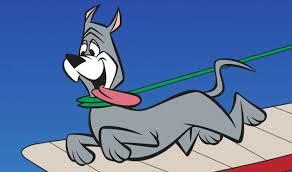 Of course, he’ll always be that energetic puppy — but I really appreciate the training and structure you gave us. Thank you for your help." "I met Victoria at Minto Brown Park. I didn’t know who she was, but I watched her handle her dog. Never before had I seen a dog so well behaved and obedient. It was a beautiful Doberman named Jetta who was off-leash, sitting near her owner, with her eyes fixed intensely on the master. Other dogs around and squirrels didn’t break that focus! Jetta was perfectly calm and waiting for her next command, while Victoria was conversing with other dog owners. I had to stop and watch what was going to happen next. Victoria decided to show her company some tricks, which Jetta performed beautifully and eagerly. Truly impressed, I thought to myself, “This is a person who knows what she is doing and knows dogs!” I walked up to Victoria and started a conversation. ​I later attended Victoria’s Doggie Parenting Class, which was very informative. It was then that I met her for a private lesson to work with my rottweiler, Sheba. To sum it all up, I have learned that Victoria cares deeply about animals. She has a lot of experience and is knowledgeable in handling dogs. She is honest about what she knows, and what she doesn’t know. She loves to have fun with animals and is very creative about games and problem solving. Furthermore, because she takes payments, she makes it possible for students to learn and receive training to improve their pets’ lives even when they struggle with resources! I am very thankful that Victoria has moved to our town!" "Victoria came to the house for an intense lesson during which our Tiger went from wild to tame. Tiger calmed down immensely. I learned gentle methods to teach Tiger who is in charge, and that it’s NOT him. When my husband came back from his hunting trip, he thought we had a new dog. Tiger is truly a “Better Best Friend” and we thank Victoria for helping all that to happen." "Last summer we were having serious problems with our 3-year-old Cocker Spaniel. He was chewing everything up while we were away at work. I contacted Victoria and she came and did a private lesson with our family. She gave us some great advice and our Cocker is now much more mellow and well behaved. The money was well spent and our home is now a much nicer place to come home to. 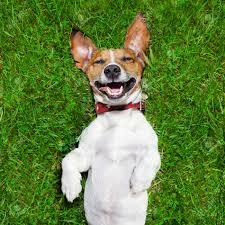 Our dog is much happier and so are we! Victoria was well worth the expense!!!!!!!!!!" Seamus - Reformed "Hound From Hell." "​Heartbroken, I offered Seamus for adoption." Victoria offered me some free advice to make it easier - then I had a lesson with her and guess what? He's STAYING right here! "My adopted stray dog, Seamus, was becoming a very real problem in my life. Over the last year, he had grown from a sweet, intelligent pup to be a very handsome, very healthy, very obnoxious pest. Training time with him had become an unwelcome chore, and I was beginning to avoid it. Ruefully, we had nicknamed him “The Hound from hell.” Life with him had become a “vicious circle” of failure. It was as if everything I had learned in the past about dog handling was useless. Not only could I not train Seamus, most of the time I could not even get his attention! My housemate and I both have multiple disabilities, and Seamus was now a 75-lb. bundle of boundless energy. In spite of our best efforts, including reasonable puppy raising and sixteen weeks of puppy obedience classes, Seamus had learned to excel at only one thing: Taking advantage of his humans! It seemed as if his only hope was to be adopted by a more capable handler before it was too late. Heartbroken, but determined to do the right thing, I went online and offered Seamus for adoption, hoping to find someone who could be the type of handler he truly needed — someone younger, stronger, faster, and more keenly observant, who would appreciate him for the wonderful dog he really was, and could bring out the best in him. One of my adoption postings was spotted by Victoria, who offered me some free advice to make life easier. While waiting for adoption offers, I subscribed to her "Doggie Parenting” newsletter, and I was immediately impressed with the quantity and quality of the information it contained. Finally, hoping to make the whole situation easier, I decided to give Victoria’s lesson a try. It couldn’t hurt, and it might help. In about an hour, Seamus was able to “settle” and relax on cue, and to interrupt his own nuisance barking! ​What was truly amazing was when Victoria began to ask me to try what she had shown me. Although slowly at first, with Victoria coaching me, I was able to pick it up. Within a few minutes, Seamus was responding to me! The “Hound from Hell” was crouched at my feet waiting for instructions! ​I was absolutely astonished. He was now happy and focused, eager to figure out what we expected of him. By the end of the session we worked out a plan of action to give Seamus the exercise he needs, until he can be trained to exercise off-leash. When his needs are met, Seamus is a very sweet companion dog. I believe that he could soon be ready for his Canine Good Citizen test. I am very pleased to say that I believe I have finally found the right home for him. You guessed it — right here! Victoria’s skills as a trainer and coach were worth every dime, because what I got back was priceless." Lesson Friday 2 pm; Van left a message on my machine the next day, Saturday, 10:30 am: “The lesson yesterday was fabulous. Lesson Friday 4/1; Sue emailed me Monday 4/4: "Interesting thing this weekend. 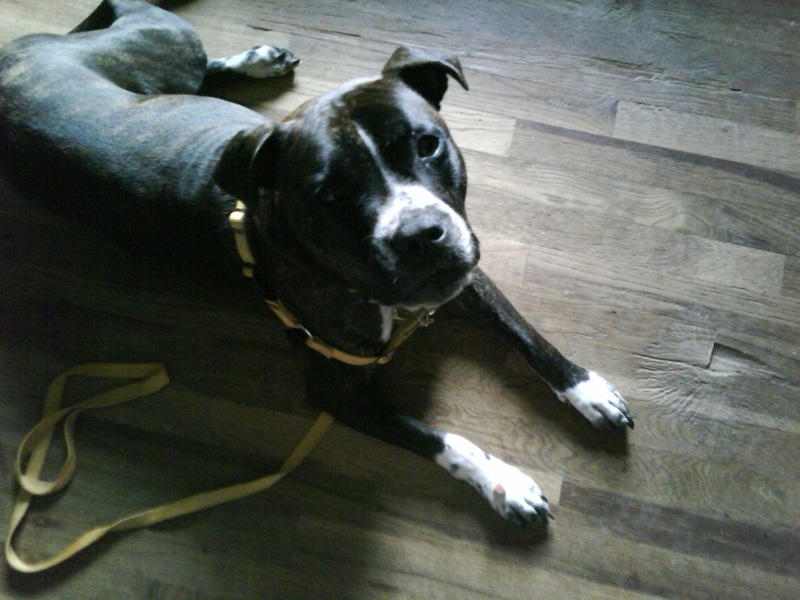 Both dogs are much quieter and sit a lot like they are waiting for our permission. Yeah!!!! And they no longer jump up on the furniture without permission. Man, that happened FAST!" 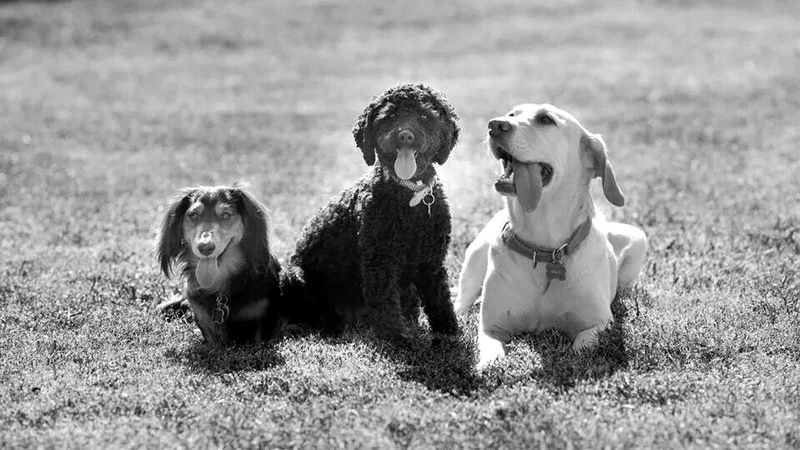 "My husband and I had the most awesome lesson with Victoria and 2 of our dogs. We have an American Eskimo who is 6 and a yellow lab we had just gotten at age 2. We were going to work with just the Eskie, but she was doing so well with Victoria that we added the Lab in as well. Within minutes, she had the Lab calm and waiting for her next command. It took the Eskie longer, as they are indeed stubborn critters. I have never wanted to do dog obedience training, but rather, I wanted a dog who would mind its manners and be a pleasure to live with. So, when I found Victoria and she expressed the same ideas, I knew we were on to something. She came to our home for a lesson. She taught us how to work effectively with our crazy dogs. Our home is so much less hectic now! We are thrilled guests to our home can be more comfortable because the dogs are under control. It’s very impressive!!! All in all, it has been $ well spent. Thanks again for the wonderful lesson!" "When I called Victoria about training, my girls, Molly and Snickers, were running the house!!! I could not even do the dishes without Molly trying to jump into the dishwasher to lick the dishes and attack the vacuum. ​It’s funny because so many people told me if I wanted to train my dogs I could not let them sleep with me and I was really concerned that she would tell me the same thing. Instead she agreed that my girls are family and if I choose to sleep with them that was ok as long as we were not having any aggression issues. Having two dogs, one of which is fearful of strangers, I really got to appreciate both methods of her dog behavior lesson. The in-home training with Molly was great and the training by phone with Snickers (fearful of strangers, so by phone was less stressful for her) was awesome as well! I have to honestly say that I would have never guessed Snickers would do so well with the phone training but Victoria was more than able to coach me and walk me through every step. I’m still just amazed at the progress my girls have made. I love Victoria’s coaching, training and professionalism! I know the sky is the limit for our training!!!"